Corey McCall is associate professor of philosophy at Elmira College. Tom Nurmi is assistant professor of English at Montana State University Billings. Melville Among the Philosophers enhanced my love of Melville and my engagement with philosophical questions. The book succeeds in its goal of showing Melville’s philosophical significance. The essays introduced some philosophers unfamiliar to me and will probably do so for most readers. Students of Melville and those interested in the relationship between literature and philosophy will enjoy this book. A thrilling collection. The essays range across Melville’s works and across Western philosophy. Melville among the Philosophers reveals just how mutually entangled literature and philosophy are for Melville, and for us. For a volume that covers every period of Melville's career, every genre in which he wrote, and puts him in dialogue with thinkers such as Plato, Nietzsche, Schmitt, C. L. R. James, Deleuze, Derrida, and Ranciere—all the while traversing the disciplinary areas of philosophy, religion, literary theory, and politics—is it really out of place to compare it to the immensity of the whale or the vastness of the ocean in Melville's greatest work? Regardless, Melville among The Philosophers will be essential reading for anyone concerned with the work and legacy of this magesterial author. Readers of Melville long have known him as a philosophical writer in a capacious, profound manner, a writer of fiction and verse who seriously engaged the most advanced philosophy of his day, as well as prominent figures in the tradition. Melville among the Philosophers reveals the multiple philosophic dimensions of his penetrating thought and language: aesthetics, religion, gender, pragmatism, colonialism, race, politics, metaphysics, and confrontations with authority and mortality. What this book most particularly does—and does superbly—is to enrich and expand the dialogue between philosophy and literature such that both disciplines become refreshed and reoriented. With ten perceptive studies, a trenchant introductory essay by the editors, and closing remarks by Cornel West, this volume will attract all readers (of philosophy and literature) who incline to, or who are willing to test, Melville’s astonishing genius and range. For more than a century readers have found Herman Melville’s writing rich with philosophical ideas, yet there has been relatively little written about what, exactly, is philosophically significant about his work and why philosophers are so attracted to Melville in particular. This volume addresses this silence through a series of essays that: (1) examine various philosophical contexts for Melville’s work, (2) take seriously Melville’s writings as philosophy, and (3) consider how modern philosophers have used Melville and the implications of appropriating Melville for contemporary thought. 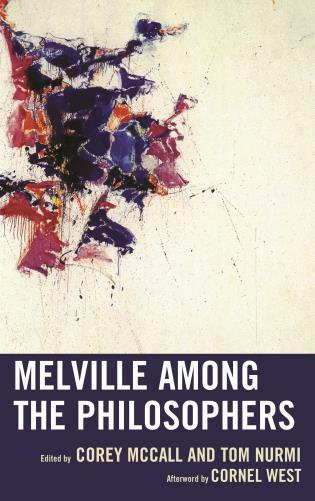 Melville among the Philosophers is ultimately an intervention across literary studies and philosophy that carves new paths into the work of one of America’s most celebrated authors, a man who continues to enchant and challenge readers well into the twenty-first century.